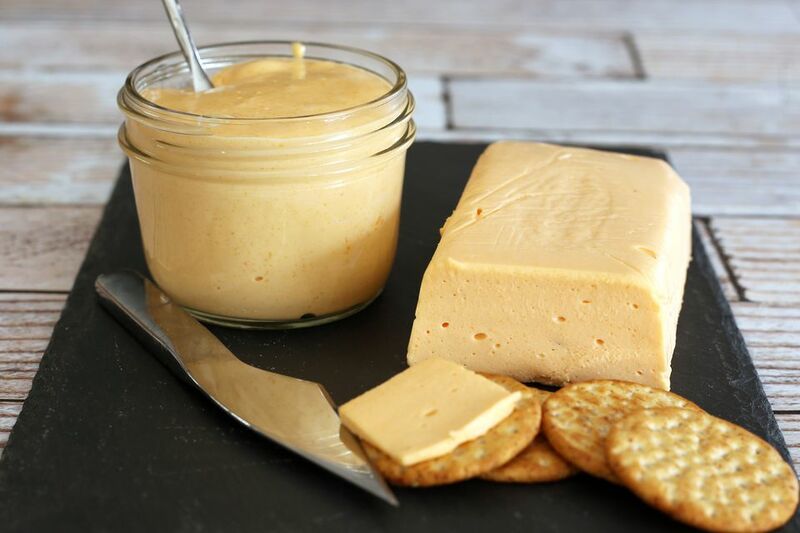 These homemade versions of the popular process cheese foods are not only easy to make; they are made with real cheese with no unwanted preservatives. Mild cheddar cheese, milk, and cream cheese are among the ingredients, and a little gelatine makes the faux Velveeta — or American cheese — solidify into a block. You can use white or orange cheese depending on how you want the finished product to look. The softer "Cheez Whiz" mixture is excellent warmed and added to hot macaroni, creamy soups, or vegetables, or use it as a warm dip with any number of additional ingredients. The American cheese substitute is similar to the popular process cheese, Velveeta. It's great for sandwiches, crackers, dips, and snacks. And it melted nicely in a basic grilled cheese sandwich. Or add it to a white sauce for vegetables, casseroles, or pasta dishes. The American cheese (Velveeta) recipe makes about 1 1/4 to 1 1/2 pounds and the Cheez Whiz clone makes about 2 cups. Line a small loaf pan with plastic wrap, leaving a few inches of excess on both sides of the pan. Alternatively, you may use smaller loaf-size containers. Put the water in a saucepan and bring to a boil. Combine the gelatine, milk powder, and salt in a blender and pulse to blend. Add the boiling water to the blender and immediately pulse a few times. Quickly add the cheddar cheese and process until smooth. Working quickly, pour or spoon the mixture into the lined pan. Use a spatula to even the top. Cover with the excess plastic wrap and refrigerate for several hours or overnight. Slice the cheese and use it for cheese and cracker snacks, sandwiches, grilled cheese, or add some to a cheese sauce or dip. Wrap in plastic wrap and store in the refrigerator. Use within 2 weeks. Put the evaporated milk in a saucepan and bring to a simmer. In a blender or food processor, combine the cheese, cream cheese, dry mustard, and salt. Add the simmering evaporated milk and process until smooth. Pour into a jar and use immediately (while warm) or refrigerate. For a thinner mixture, add some extra hot milk or cream. Have the shredded cheese opened and close at hand so you can add it immediately. The mixture thickens quickly. If your blender doesn't handle thick mixtures well, try a food processor. Use half pepper jack cheese in the Velveeta or add a few tablespoons of canned finely chopped jalapeno or mild green chile peppers along with the cheese. Add a dash or garlic powder and a dash of onion powder to the homemade Cheez-Whiz, or use a seasoned salt blend instead of table salt.